I can't even remember what I ordered, if anything; perhaps I just got swept up with the crowd. 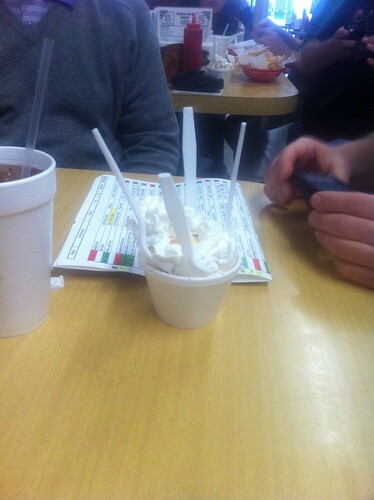 The banana pudding was very good. 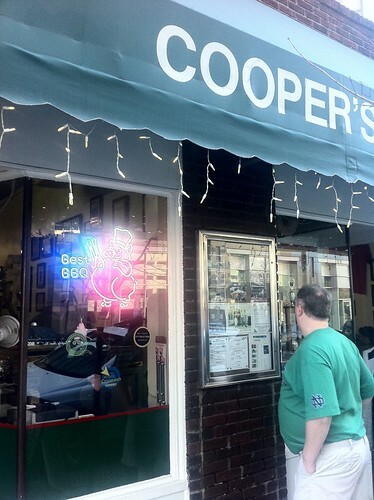 In the background, you can see the spreadsheet ChiTownDiner uses to chart his Roadfood course. 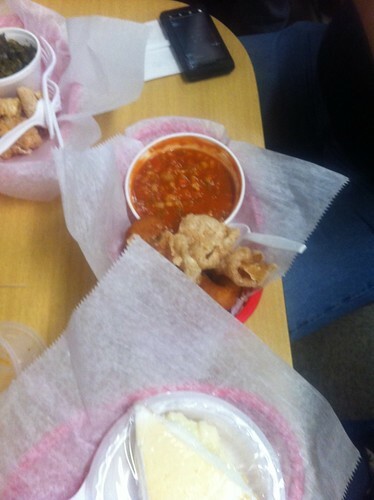 The Brunswick stew didn't engage me, and I remember Chris Ayers saying it tasted mostly of vegetables, not of meat. The online menu provides a hint: the menu says their Brunswick stew is made with vegetables and chicken - but doesn't mention pork. 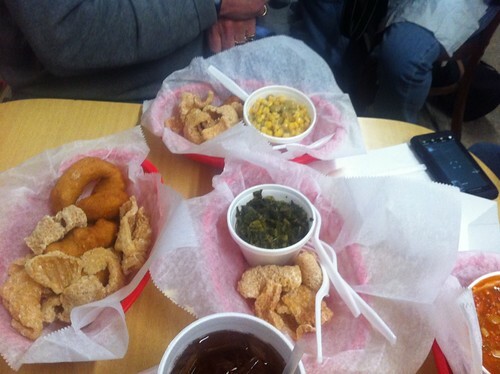 I recall the greens and the corn being very good, and I enjoyed the pork rinds that came with every dish. Lori, though, was very suspicious of the pork rinds, and dismissed them after a token nibble. 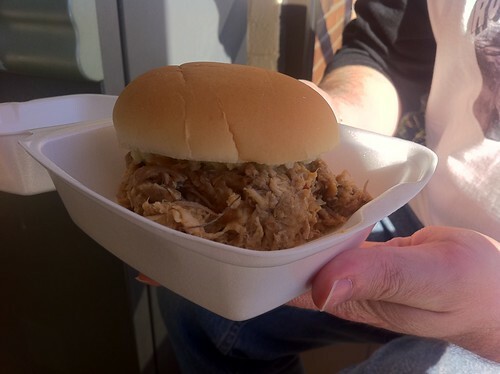 The barbecue sandwich made no impression on my memory at all, I'm sad to say. From there, we drove off to the Roast Grill, also in Raleigh. Some of our group had left to do their own things, but we still had about as many members as there were seats in the Roast Grill. I did not try to force my way in; ChiTownDiner made his way in by the expedient of waiting for a seat to vacate, then slipping in immediately. 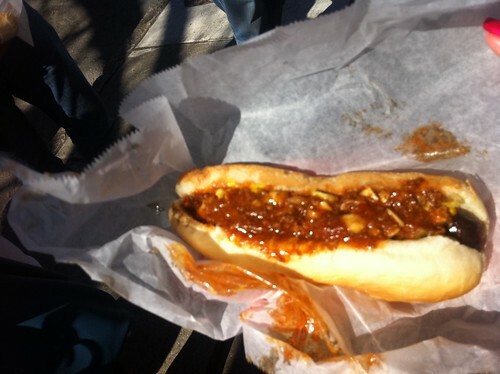 The Roast Grill hot dog was almost invisible from chili and toppings, but I could tell from a bite that it had been cooked until it was black. This sausage didn't snap - it was more of a crunch. From there, the Quest For Pie pointed towards Mad Hatter Bakeshop in Durham. Lori and I took a detour on our way there to go by Sunrise Biscuit Kitchen, because we had not visited it at sunrise as the other folks did. 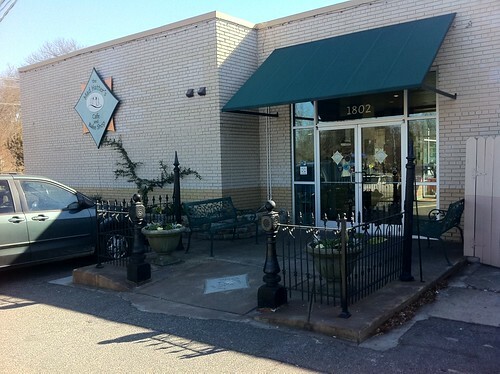 Sunrise Biscuit Kitchen is a cheerful little restaurant that's drive-through only. 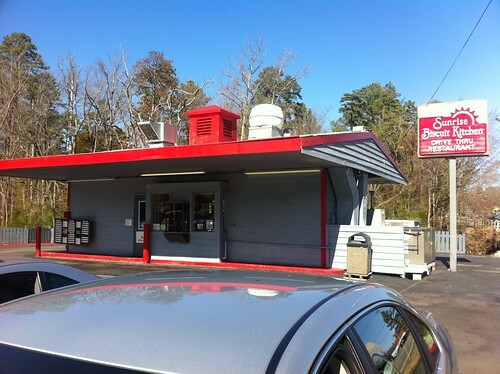 I cannot recall a previous visit to a drive-through restaurant that's not a chain. We shared a fried chicken biscuit, and though I would call it good, it was very unassuming; neither biscuit nor chicken called much attention to themselves. 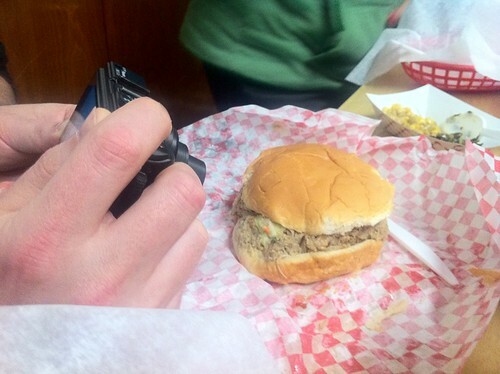 But I think it would be unfair to judge it too harshly for that, because I think that's what it was trying to be, and it wasn't trying to be an intensely flavorful bite. I'm skeptical about whether you could really eat this while driving, though - my intuition is that if you ate this while driving to work, you'd walk into work with a chest full of crumbs. I think, though, that this is one of the best pictures I took in the whole trip. Mad Hatter's website advertises apple, cherry, pecan, blueberry, pumpkin, and key lime pies - but when we visited, they had none of them for sale. 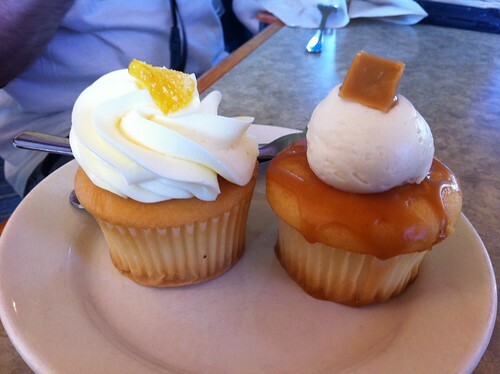 Lori chose a lemon cupcake and a caramel cupcake to share with Chris, Gregg, and Cliff; both were very good. Readers keeping careful count will notice that this was the sixth restaurant we had visited so far, and all of us were slowing down a little and thinking of the virtues of naps and digestion time. 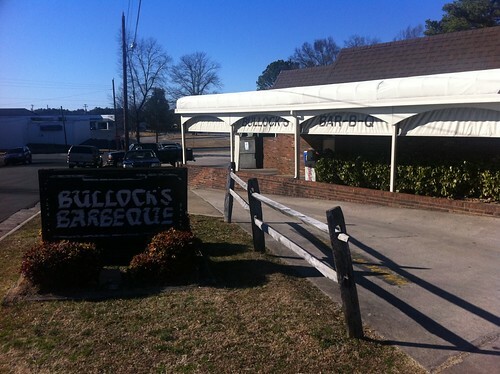 But Chris pointed out that Bullock's Bar-B-Cue was very close, and could give us one more sampling of North Carolina barbecue. I was easily persuaded, so we set off there. 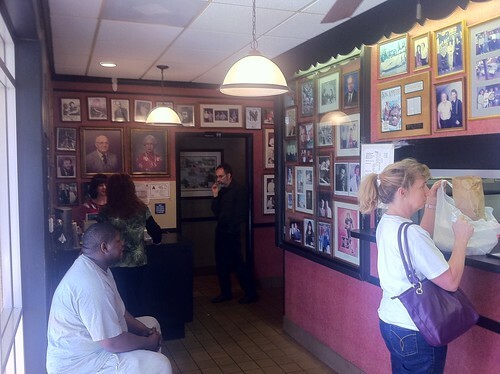 Bullock's anteroom is decorated with portraits of the founders, sports teams supported by the restaurant, and quondam celebrities who have visited. We shared a barbecue sandwich. 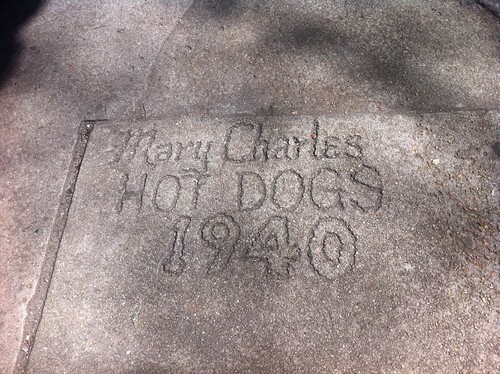 I recall that this sandwich was rather vinegary, but I don't recall much else about it. From there, we dropped one car at Allen and Son, and rode with Chris to UNC to hang out and digest a bit before dinner. The most notable thing in our UNC visit that day was a man with a pretty dog and a sign saying "Dog Tricks $1". Lori is a soft touch for a charitable appeal and was quick to fish out a dollar. The man told her to crumple up the bill and hide it in a nearby alley, while he kept the dog out of sight. 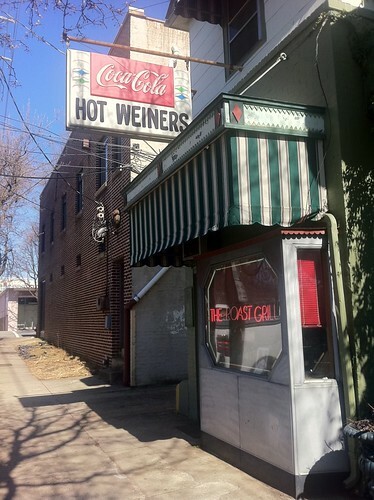 We tucked the bill behind a drainpipe and said that we were ready, at which point the man told the dog, "Beans, go get it!" Beans sniffed around a bit, then found the bill, pulled it out neatly with his teeth, and returned to drop the bill at his master's feet. It was a good trick, and we clapped heartily - but it would have been even more impressive with two quarters and five dimes instead of a dollar bill.